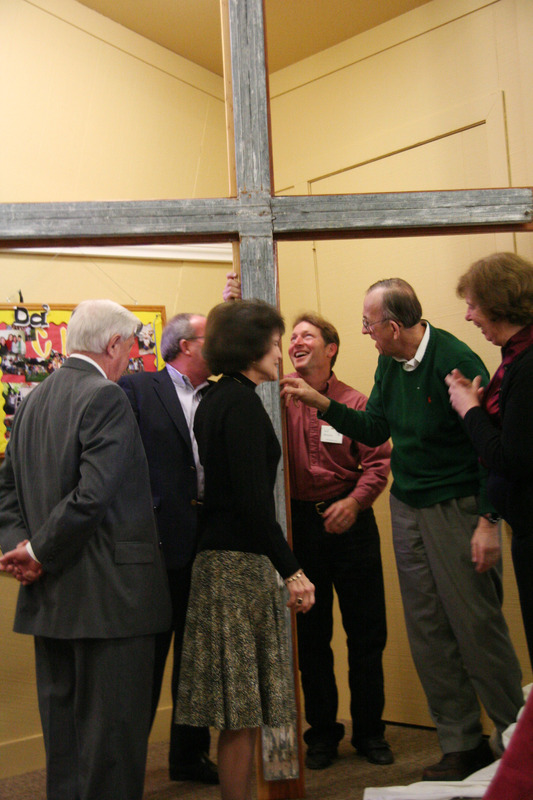 The original cross that stood above the Upper Room was dedicated in Link Hall. On July 19, 1967, a small but dedicated group of believers held their first worship service in the “Upper Room” on the second floor of the strip mall now known as the South Hills Shopping Center on South Land Park Drive. The Reverend Walter Link served as the organizing pastor. A formal steering committee was elected, a choir organized, and education and fellowship programs began. 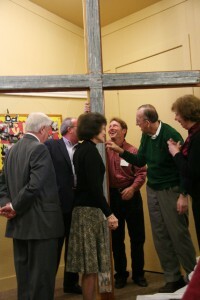 Twenty-nine months later the Sacramento Presbytery voted to organize Faith Presbyterian Church. The organizational service was held on December 21, 1969, at the Greenhaven Lutheran Church. Services were moved to rented quarters at Parkside Community Church in early 1970, with Walter Link as pastor. The congregation moved again in 1973 to Riverside Wesleyan Church (now renamed River’s Edge Church), near the corner of Florin Road and Riverside Blvd. Land at 625 Florin Road was purchased by the Sacramento Presbytery in 1965, and by 1980 a 200-seat multipurpose room, church offices, a kitchen, family room, nursery, lavatories, and two classrooms were built on the site. Membership growth demanded the addition of two more classrooms in the mid-1980s. See the church’s early history photo gallery by clicking here. A fund drive to finance a new Sanctuary was begun in 1989. On “Miracle Sunday,” May 14, 1989, over $60,000 was raised! On March 8, 1992, ground was broken for the 350-seat sanctuary and the first service was held in the new (and present) sanctuary on Palm Sunday, April 4, 1993. Faith’s congregation grew to nearly 550 members by 2000. Along with church programs, the percentage of monies given to general mission also continued to increase, reaching 21.5% of the budget in 1993. Participation in local mission activities flourished. In 2005 Session adopted our current vision statement: “a community loving Christ, building disciples, serving all.” The Faith congregation continued to shift its focus towards “those outside its walls” by housing and feeding a small group of homeless families for a week on church grounds once a quarter through the nationwide Family Promise program. Additionally, Faith opened its doors to a local Ethiopian Orthodox congregation seeking space to worship each week. Around the world and in the local community, Faith continued to demonstrate Christ’s love by providing help where it was needed. By late 2006, nearly 200 members of Faith’s community were participating in Life Groups— small groups meeting regularly to grow in their faith in Christ. In 2008 the members of the church reached out to the community by performing a weekend of service activities, called Compassion Weekend. Over 300 church and community members participated. Faith also opened its doors to another congregation, Korean Vision Church, which began meeting on Sunday afternoons in Faith’s sanctuary. In March 2010 Faith sent a Vision Team to Ethiopia to explore and entertain the possibility of a long-term partnership with the Abaya Area Development Project through World Vision. Through this partnership, the Faith family now sponsors more than 100 children from the Abaya area. And thanks to the pledges from Faith members and several large and generous donations, Faith has helped the Abaya community to build a water project that provides accessible fresh water for more than 5,000 people and also to build classrooms in a school for 80 children. Faith also partners with the South Sacramento Interfaith Partnership (SSIP) Food Closet to help feed our hungry neighbors; with Reading Partners to help support budding readers in local Sacramento elementary schools; and with the Moral Values Program to help strengthen youth in their academic, home and community contexts. Faith directly supports mission outreach in Sacramento, Ethiopia, and Paris, and gives to mission efforts through our denomination, the Presbyterian Church (USA). One of the enduring hallmarks of the Faith community is our commitment to living into Jesus’ mandate to “love one another as I have loved you” (John 13:34). What does it mean to live as a disciple of Christ in faithfulness to the Word of God and to love one another across the lines that divide so many within our communities and our country? What does it mean to love Christ and our unity in Christ more than our differences of opinion, even our differences of opinion about doctrinal non-essentials? We don’t have all the answers … not even close! And we can definitely say it’s messy. Despite the mess, we continue to strive, with the Lord’s help, to grow more fully and faithfully into a community loving Christ, building disciples, and serving all. We invite to join us on the way!